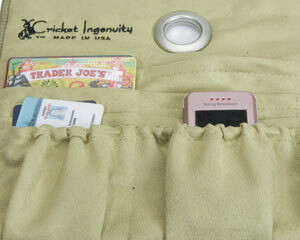 We love Cricket Ingenuity’s purse organizers and auto trash bags—not only because they’re machine washable, emblazoned with the fruits of the North and a neat-freak’s necessities. We also adore ’em because they’re skillfully sewn by Suit Yourself Sewing Co. in Kingsley, which has been struggling since the close of Traverse City’s Tru-Fit Trouser Factory. Find them at Traverse City’s Votruba Leather Goods Co., 231-947-5615 and Chateau Chantal, 231-223-4110, or Shady Lane Cellars, Suttons Bay, 231-947-8865.